One of the quickest, easiest ways to start saving money is to change your bar code. Many shippers are accustomed to using the “Postnet” bar code for all their mailings. This is appropriate for letters, periodicals (magazines) and most Standard Mail shipments. However, for the package services, there is a different bar code. Simply by using the Parcel Bar Code, the USPS will give you a 3 cent discount per piece. This may not sound like much at first, but if you mail 100,000 pieces, it will save you $3,000. Further, this is a simple change that can be implemented by your printer operator in less than an hour without involving any changes to your mail presort files or programming. Most classes of mail offer discounts for “drop shipping”. This is a process whereby you prepare your mailing, then use Priority Mail, UPS, LTL truck, or other shipping methods to move the items closer to their final address. The USPS then gives you “destination entry” discounts. Bound Printed Matter also offers a DBMC (destination Bulk Mail Center) discount. However, since BPM is based on a “zoned” rate, you can save much more. The DBMC discount becomes simply icing on the cake. 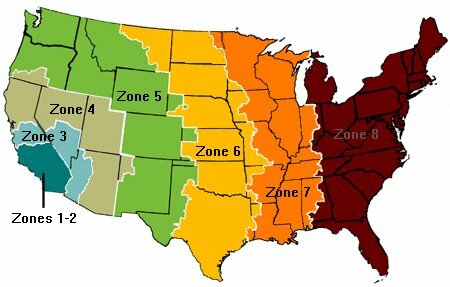 This map will explain what zones are, and how they can be used to save money. Zoning means that you pay different amounts of postage based on the distance the USPS must carry the package. The map illustrates the zones for a shipper located in southern California. As you can see, the farther the package has to travel from the shipper, the higher the zone (and postage) becomes. For example, if this shipper’s customer is in Virginia, this is zone 8. With the normal presort discounts; a package weighing 1.5 pounds will cost $2.16. Depending on the volume of mail delivering in that general area, you could drop ship to a regional center instead. You would then only pay zone 2 postage, and gain other discounts. The postage could drop to $1.23, or lessOf course, it’s not a free ride. You still have to ship the mail to the processing center, but with that much postage difference, it’s easy to see how there’s still a very nice net savings. As mentioned, there are also minimum volume requirements. However, even with these restrictions, many shippers can generate significant savings with national mailings as small as 2,500 pieces, or even less if the mail is geographically concentrated. If you have enough volume, you can drop ship yourself. If not, there are several consolidation services that can help you. By combining your mail with other mailers, they can build shipments that have enough volume to justify the freight. We can help you find a consolidator if you don’t already have a preference. While it’s really a subject unto itself, but Mail Manifesting deserves a mention here. If your shipments consist of a number of small mailings, you might want to consider mail manifesting. By placing a unique identifier on each piece and tracking the pallets, you can combine the mailings, and obtain bulk postage rates and drop shipping discounts on even your smallest shipments. This can also be combined with the use of a consolidation service. That’s a lot of information in one paragraph. To put it another way, instead of shipping one book out at the single piece rate, you can combine it with other shipments and treat it as part of a bulk mailing. If our example package above were mailed at single piece rate, it would cost $2.62. wouldn’t it be better to pay the same $1.23 you do for a bulk parcel? Most mail houses that understand how to process Bound Printed Matter fall into two categories. They are either publishers that do their own shipping, or printing and distribution plants. Since we are not affiliated with any particular publisher, printer, or distributor, we can offer this service in a vendor-neutral environment. Either as stand-alone mailings, or as part of a mail manifest, our system is able to analyze the distribution of your addresses and products, and create an optimized drop shipping plan. Regional centers with too little volume to stand alone can be combined with other nearby destinations and still generate postal savings. In the end, an easy to follow sort is developed that balances postage savings with freight and labor costs to maximize all your efforts. The output is then tailored to fit seamlessly into your existing fulfillment operations. If you’re a publisher, we can help you learn to do this yourself or teach your favorite shipper to properly handle the procedures. You can expect to receive the same level of maximized postage savings wherever you ship. If you’re a printer or distribution center, together we can develop a valuable new resource for your customers and a potential new revenue stream for you. Here are some examples of how this process has worked at other locations. 1 – A mailing list is sent in (or purchased). All the necessary presort processing is performed, and a sorted file is returned, along with all the relevant postal paperwork. This output list is used for printing the addresses (by inkjet, etc) at the shipper’s location. We can pre-format the file so it’s ready to be used by most production inkjet and label printers. 2 – A list of orders is sent in. After presort processing, labels or invoices (label bills) are printed and processed. These are sent to the shipper, who applies them to the books. 3 – All printing and shipping operations are performed by the shipper on site (usually with remote setup and support). A data file is transmitted providing the information needed for manifesting. This information is used to create the manifest documents, data files and paperwork used by the USPS to verify the mail. There are a number of combinations of these basic patterns in production. As you can see, the procedures are very flexible. It’s also much easier to perform the actual sorting of the books than you might think. With the materials we provide, any shipper or mailer can learn to process Bound Printed Matter in the most efficient way possible.